English podcast: Gardening is an interesting episode about the things people grow to eat, you will also hear all about how people make their yards look every spring. Enjoy this episode and improve your English listening with us! Join Us as a FREE Member! Growing your own fruits and vegetable is an activity that is gaining popularity all around the world. In some cities, you may even find community gardens where you can rent a space to grow what you want. 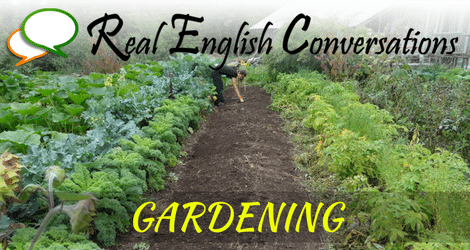 In this English Podcast about gardening Curtis and I discuss the things that we grew in our small garden in the backyard. Later in the podcast, we discuss our friend that has an organic vegetable farm and why we should consider eating organic. The reality is that more and more pesticides and chemicals are being put on the food that we eat and it can be dangerous to our health. The a good way to guarantee your food is pesticide free and organic… is to grow it yourself or have a small garden! Hey Martin! What did you think of this conversation?